November was an important milestone for us at Hahndorf Hill Winery as our ‘White Mischief’ Gruner Veltliner 2016 won the Trophy for Best Gruner Veltliner at the Adelaide Hills Wine Show 2016, plus we were awarded the Trophy for Best Producer of Show (<100 tonnes). Nick Stock, Chairman of Judges, spoke at the Show’s award lunch about how the Gruner Veltliner producers in the Adelaide Hills had made ‘amazing strides in a relatively short time’. This success followed on from our ‘GRU’ Gruner Veltliner 2015 being selected to represent Australia at the prestigious Six Nations Wine Challenge 2016, where it brought home a Double Gold Medal. 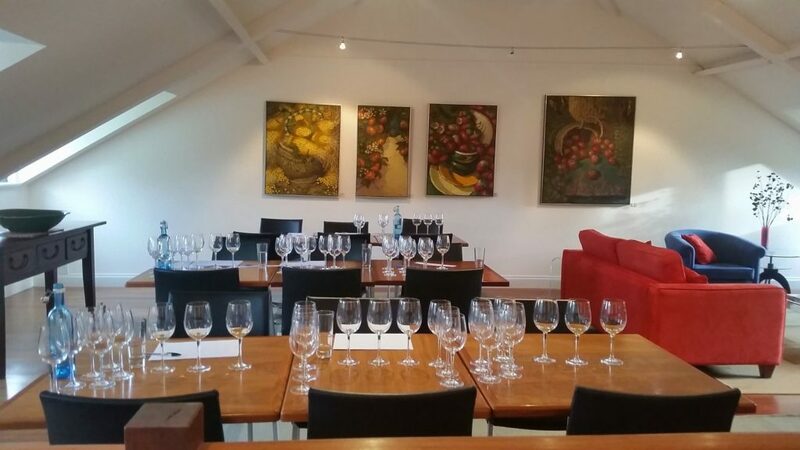 November also featured the highlights of two separate Gruner Veltliner tastings – one organised by ourselves for our staff at the Hahndorf Hill cellar door, and the other organised by Willi Klinger, managing director of the Austrian Wine Marketing Board. This tasting was held in association with Nick Stock and the Adelaide Hills Wine Region and held at the Stanley Bridge Hotel in nearby Verdun. The aim of the Hahndorf Hill Gruner Tasting was to further refine our staffs’ understanding of this wonderful grape variety, and various flights were arranged in order of style and age, featuring both Austrian and New World versions. 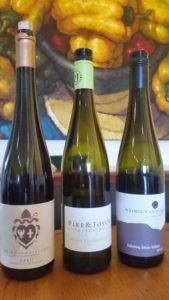 Flight 1 featured the Weinhofmeisterei Mathias Hirtzberger ‘Treu’ Federspiel 2014 (Wachau); the Pike & Joyce ‘Separe’ 2014 (Adelaide Hills); and the Am Berg ‘Kellerberg’ 2014 (Kamptal DAC). The ‘Treu’ was produced by Mathias, son of the renowned Franz Hirtzberger winery from the village of Spitz in the Wachau. We met the friendly and innovative Mathias during our last visit to Austria. The ‘Separe’ came from the beautiful Pike & Joyce vineyard in the cool Lenswood area of the Adelaide Hills. The ‘Kellerberg’ came from a family-run winery in the village of Mittelberg in the Kamptal and, like many vineyards in Austria, the vines are surrounded by old fruit trees and vegetable/ herb patches – hence the owners call their property a ‘Weingarten’ (a wine garden). This wine took top honours at the Langenlois Wine Show. 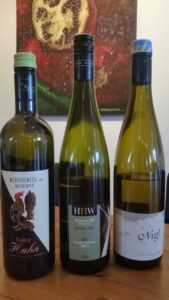 Flight 2 featured the Familie Hahn 2013 (Weinviertel Reserve); the Hahndorf Hill ‘GRU’ 2013 (Adelaide Hills); and the Nigl ‘Privat’ 2013 (Kremstal Reserve). The ‘Familie Hahn’ winery is situated in the village of Hohenruppersdorf in the vast Weinviertel wine region, and, like the emblem of the German-heritage town of Hahndorf in South Australia from which our winery takes its name, it features a rooster (Hahn) on its label. Mr Hahn came specially to our cellar door on his last visit to Australia and we thoroughly enjoyed visiting his picturesque winery in Austria. The 2013 ‘GRU’ was the ripest version of ‘GRU’ we have made yet, in our journey of learning in the vineyard of how Gruner Veltliner can best ripen with optimum fruit flavour yet still retain its bracing and characteristic acidity. Nigl is one of a select number of Austrian producers whose wines can be found gracing the wine lists of top restaurants within Australia. The vineyards of Nigl are set in terraces along the Krems river right in the heart of the Kremstal valley, as well as in and around the medieval wine town of Krems. Flight 3 featured the Jurtschitsch ‘Lamm’ 2013 (Kamptal Reserve); the Brundlmayer ‘Spiegel’ 2013 (Kamptal Reserve); and the Rabl ‘Kaferberg Alte Reben’ 2013 (Kamptal Reserve). Jurtschitsch is one of Austria’s most acclaimed wineries, situated in the 1000-year-old wine town of Langenlois in the Kamptal wine region. ‘Lamm’ refers to its cult vineyard (the name is derived from the word ‘loam’), although the soil in the vineyard is more famous for its metres-high layers of loess. The Lamm vineyard receives reduced late-afternoon sunshine and is also subject to cooling winds, so there is a significant fluctuation between the day and night temperatures. Brundlmayer is another of Austria’s most acclaimed wineries, also situated in Langenlois. The vineyard used for this particular wine is also notable for its significant loess with its balanced mineral composition. The loess allows the Gruner Veltliner vines to be deeply rooted so that they are not adversely affected even in long periods of drought. This wine was the general favourite of the tasting. Rabl is also one of Austria’s most well-known wineries, dating back to 1750. Rudi Rabl gives his wines ‘plenty of freedom’ in the cellar and is a true advocate of wild fermentation and long maceration. During our last visit to Austria we had the great pleasure of being taken by Rudi on a personal tour of the historic Rabl underground cellars and tunnels, which wend their way far beneath the bustling market streets of Langenlois. Flight 4 featured the Hahndorf Hill ‘GRU’ 2012 (Adelaide Hills); the Konrad 2011 (Marlborough, New Zealand); and the Stift Goettweig ‘Goettweigerberg’ 2010 (Kremstal DAC). Our ‘GRU’ 2012 was the wine which won us first place in the 2013 Falstaff International Wine Tasting competition held in Vienna. It was developing well and in typical fashion was developing caramelized citrus components as well as characteristic tobacco elements. The Konrad was the best Gruner Veltliner we have tasted yet from New Zealand, and it had aged exceptionally well. 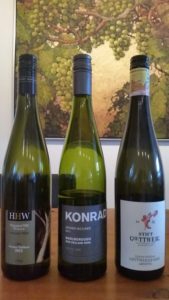 Konrad is the label of a German winemaker who emigrated to New Zealand, and the grapes came from a vineyard in the Waihopai Valley in Marlborough. The ‘Goettweigerberg’ hails from the Benedictine monastery of Goettweig, situated on the south bank of the Danube opposite the town of Krems. At 449m above sea level, situated on the Goettweiger mountain, it offers amazing views from its terraces, as we can attest from having toured the medieval complex and enjoyed its tea-room and tasting-room. Tasting 2 – presented by Willi Klinger from the Austrian Wine Marketing Board at Stanley Bridge Hotel, Verdun. At the Gruner Veltliner tasting organised by the AWMB together with Nick Stock and the Adelaide Hills Wine Region, we had the great pleasure of meeting the irrepressible Willi Klinger, Team Managing Director of the Austrian Wine Marketing Board. 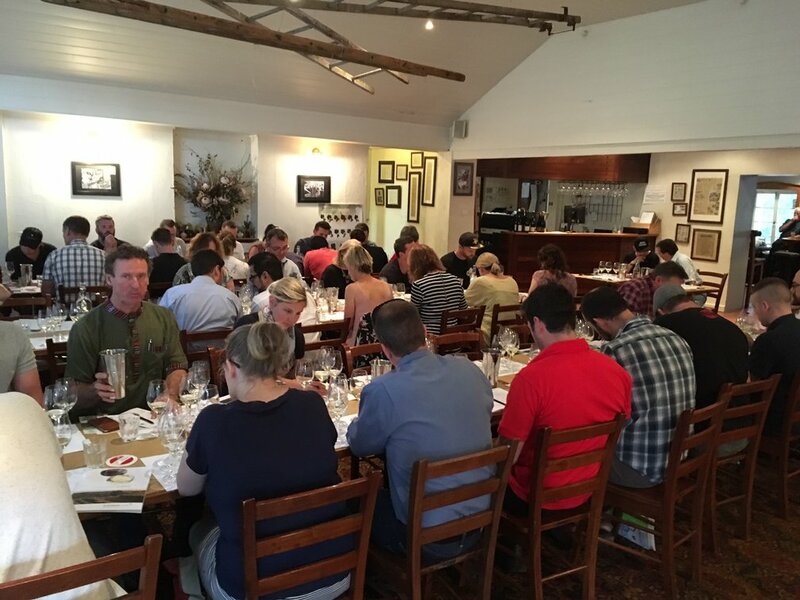 This ticketed event was sold out very quickly, leaving many Adelaide Hills vignerons disappointed that they had missed out, but more than 40 fortunate winemakers were able to attend at the Stanley Bridge Hotel in Verdun. Willi’s presentation of three flights of superb Austrian Gruner Veltliners was accompanied with wit and welcome insights. He revealed how the loess in certain Austrian vineyards can contribute to the creaminess found in certain desirable Gruners. Flight 1 featured the Huber Markus Klassik Ried Obere Steigen 2015 (Trainsental DAC); the Jurtschitsch Klassik ‘Stein’ 2015 (Kamptal DAC); the Nigl Klassic Ried Senftenberger Piri 2015 (Kremstal DAC); and the Groiss Reserve Ried In der Schablau 2015 (Weinviertel DAC). Flight 2 featured the Ott Bernhard Ried Feuersbrunner Rosenberg ‘I OTW’ 2015 (Wagram); the Tegernseerhof Smaragd Ried Hohereck 2015 (Wachau); the Brundlmayer Reserve Ried Kaferberg ‘I OTW’ (Kamptal DAC); and the Stadt Krems Reserve Ried Wachtberg ‘1 OTW’ 2013 (Kremstal DAC). Flight 3 featured the Knoll Smaragd ‘Vinothekfullung’ 2006 (Wachau); the Schloss Gobelsburg Reserve ‘Tradition’ 2004 (Kamptal); and the Nikolaihof Smaragd Im Weingebirge 1997 (Wachau). 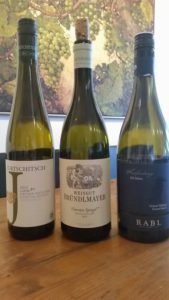 This was an excellent selection of wines and it was particularly interesting to see how beautifully the aged versions had evolved, lending huge credence to the general Austrian mantra that Gruner Veltliner is a variety which should be given the opportunity to develop in the bottle. It was also very pleasing to observe that local Adelaide Hills Gruners are being produced with all the charm and complexity of the Austrian versions. This entry was posted in Adelaide Hills, Adelaide Hills Gruner Veltliner, Adelaide Hills wine, Adelaide Hills wine region, Blaufrankisch, cool climate wine, Diurnal variation temperature, Gruner Veltliner, Gruner Veltliner Australia, Hahndorf, roses, St Laurent, Uncategorized, wine, Zweigelt, Zweigelt Australia and tagged Adelaide Hills, Adelaide Hills wine, Adelaide Hills winery, Blaufrankisch, cool climate wines, Diurnal variation temperature grapes, Gru, Gruner Veltliner, Hahndorf Hill Gruner Veltliner, Zweigelt, Zweigelt Australia. Bookmark the permalink.